CAPO also confirmed to have lied about “police dressed as protesters,” in yet another egregious episode exposing Shinawatra regime as illegitimate and intolerable. 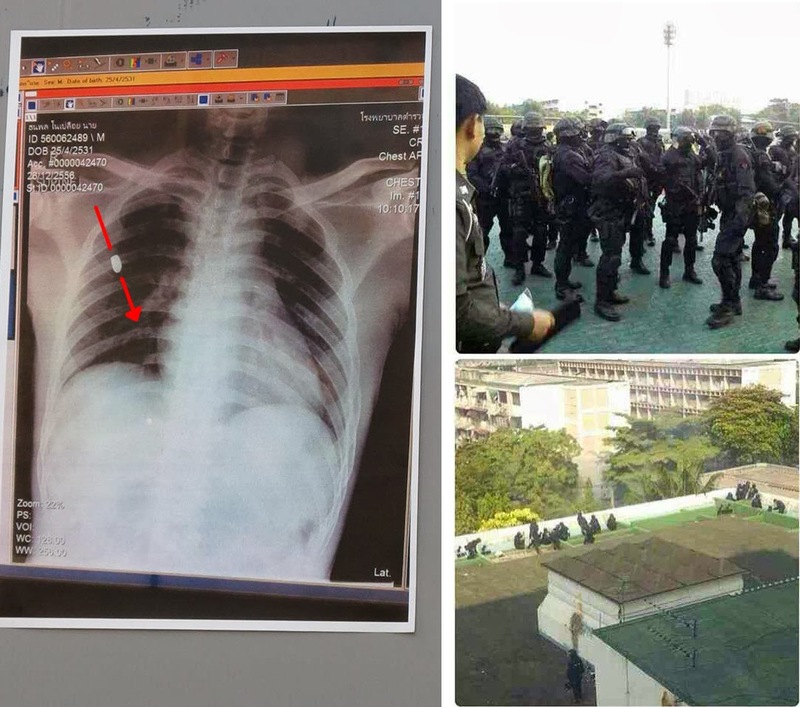 National Police Office commissioner Pol Gen Adul Saengsingkaew this morning admitted that the men in black” on the roof-top of the Labor Ministry’s building near the Thai-Japan youth centre in Din Daeng are police. The national police commissioner’s official admittance came as he led senior police officers to deliver best wishes and receive New Year blessings from the president of the Privy Council Gen Prem Tinsulanonda this morning. Pol Gen Adul admitted that “men in black” are police and vowed to investigate and bring them to justice procedure. He also admitted that the men in anti-riot uniforms who were seen smashing the windshields of a vehicle of a volunteer nurse are also the police. Forensic police confirmed that ballistic test showed that the dead policeman, Narong Pitisit, was shot from a high ground. Now that it is confirmed that these gunmen were in fact deployed by the regime, as all evidence had suggested, the blame for deaths caused by these gunmen must be appropriately shifted to the regime itself. Image: It is now confirmed by the regime itself that the heavily armed gunmen pictured to the right were police. The x-ray to the left is that of Police Sergeant Major Narong Pitisit, confirmed to have been killed by a bullet fired from above. While the regime and its busy propagandists have made great efforts to blame the protesters for his death, it is now clear that he was killed by the regime’s own gunmen. In the wake of the fallen police officer, and despite all evidence suggesting otherwise, the regime carried out a bizarre, highly politicized campaign to discredit the protesters as “cop killers” and even staged a 500-strong police “rally” next to the site of encamped anti-regime protesters demanding that they be allowed to “defend themselves” from the violence that allegedly killed their fellow police officer. It appears that only thing they need protection from is the regime they work for who would gladly shed their blood in exchange for temporary political leverage. Disturbing reports came out in November that the regime was planning to stage violence against police and civilians in order to discredit protesters. It remains to be seen if these same 500 police officers will now assemble outside the office of regime figurehead, Yingluck Shinawatra, knowing who the real culprit was behind the death of their fallen fellow officer. The Center for the Administration of Peace and Order (CAPO) Saturday alleged that some protesters disguised themselves as policemen to smash windshields of people’s vehicles near the Bangkok Youth Centre Thursday to blame police for the violence. CAPO Spokesman Pol Maj Gen Piya Uthayo said at a press conference that police had arrested a protester who allegedly admitted that he was paid Bt500 to disguise himself as a policeman to hit the vehicles. This is now confirmed to be a lie, with CAPO’s credibility rent asunder. The deadly violence and extensive property damage has been exposed to be entirely the work of the regime itself, which had fabricated cartoonish lies that withered under a torrent of evidence and demands by the protesters for justice not only for themselves but for fallen Police Sergeant Major Narong Pitisit as well. Video: After a humiliating claim that police were conducting themselves “in line with international standards” video would emerge of regime police destroying vehicles suspected to belong to protesters who had already departed for another venue. The police would ravage the truck of medical volunteers with the volunteers trapped inside. The regime would go as far as claiming the protesters disguised themselves as a battalion of riot police to stage the incident. Police General Adul Saengsingkaew now admits it was indeed regime police. While the West’s media and the regime’s many propagandists will still claim this is a matter of defending “democracy,” by the regime’s own admissions of intentionally deceiving the public over violence it itself orchestrated to discredit anti-regime protesters, it is clear this is instead a matter of dislodging dangerous criminals from the levers of power in a nation whose future depends on the protesters’ success. From December 26 onward, the protesters have been right, and the regime caught in a series of lies as they backpedaled toward the truth. From this point onward, nothing the regime or its Western allies say can be granted any credibility. From lies that battalions of police were instead “protesters dressed up,” to feigning ignorance over professional gunmen shooting down upon police and protesters alike from buildings they themselves controlled throughout the duration of clashes with protesters, the regime has proven themselves as duplicitous, now admitted liars with the West’s media houses serving as willing accomplices.